Typical early Fifties West Coast, pitting the king of the alto against the king of the baritone, with Chet Baker thrown in for good measure. Everyone with total mastery of both instrument and genre, kicking off from a range of standards. Better said than by me. Seems to have been quite a few West Coast Vogue UK releases come to market at the same time, offering temporary relief from the lack of affordable Blue Notes that I haven’t already got. Sounds good in any event. Ever-dependable Decca pressing with 1B matrix codes. There were a large number of “X meets Y” formula records at this time. With jazz populated by giant musical personalities, guesting must have become a way of life. 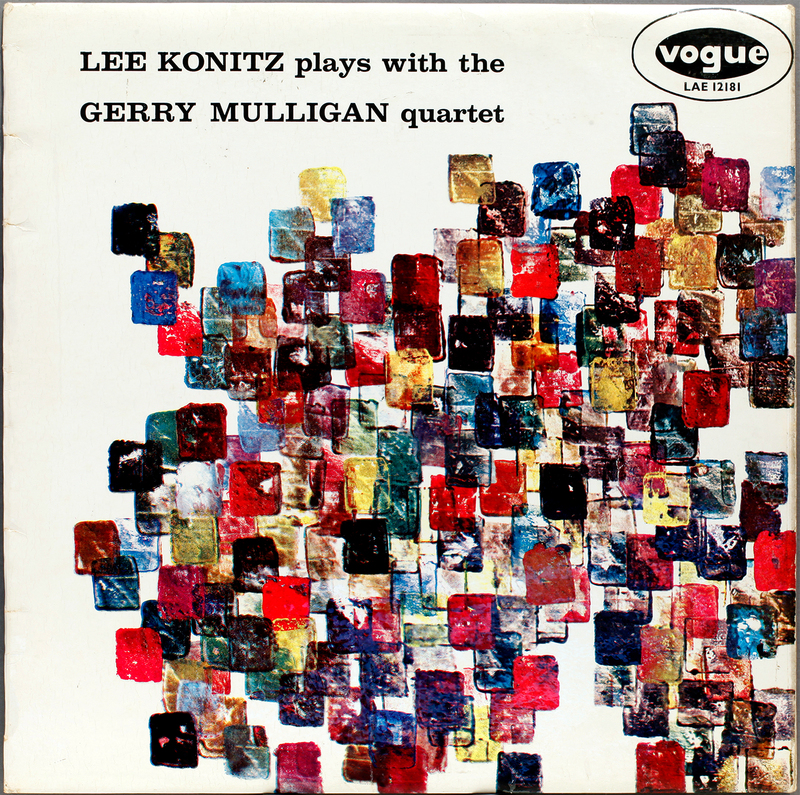 Mulligan meets Konitz, Konitz meets Mulligan, Mulligan meets Monk, Monk meets Blakey, Konitz meets Giuffre, Konitz meets Friedman, Mulligan meets Ben Webster, Mulligan meets Johnny Hodges, Mulligan meets Scott Hamilton,and so on, you get the picture. Now with Twitter they can just follow each other. Inexpensive, not top of collectors wants lists, this is great classic jazz on the cheap. 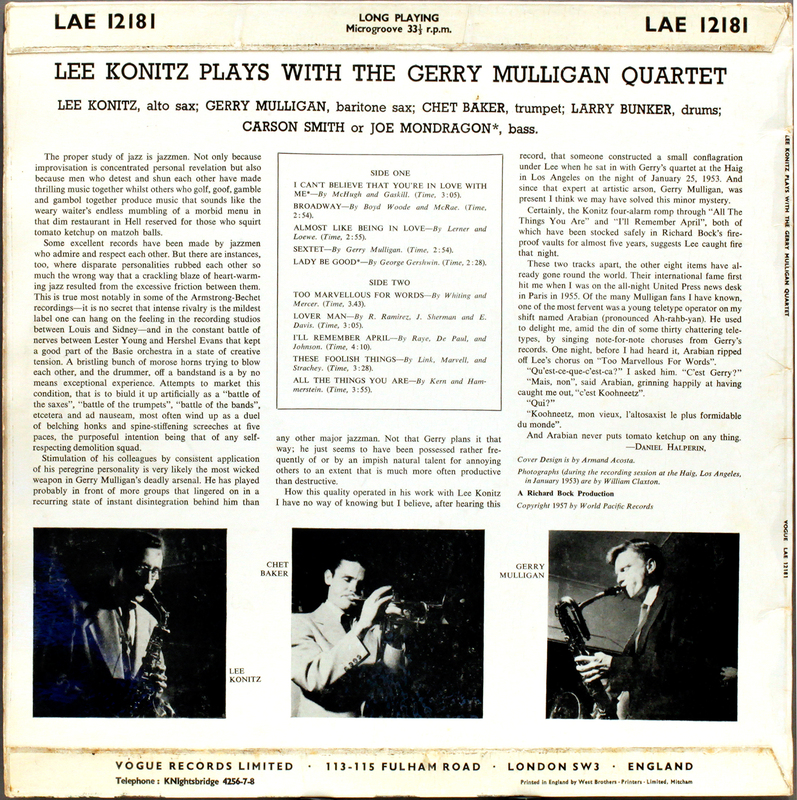 This entry was posted in Lee Konitz, Vogue, West Coast and tagged Carson Smith, Chet Baker, Gerry Mulligan, Joe Mondragon, Larry Bunker, Lee Konitz, Pacific Jazz, Vogue by LondonJazzCollector. Bookmark the permalink. How odd. I’m playing this right now on a Fontana pressing. I googled for some further info and this post came up — which of course I must have read at the time but had since completely forgotten. In any case, what just struck me is that side two is live, or at least is in front of an audience. The fact that I have only just noticed this suggests I may never have played side two of my LP. A disgrace. The strange thing is that neither the sleeve notes nor any other source I have been able to find says that side two is live. Any further info, LJC? That’s easy, Alun. The live tracks were recorded at The Hague (see CD releases). Thanks, Eduard — you’re quite right. Maybe I missed these results when I searched at the weekend (I was using my wife’s iPad and I have a theory that the iPad uses a smaller, inferior version of the internet)… Anyway, recorded at The Haig, a Los Angeles club. I won’t go back to the well known shoes vs records never ending story. here I would like to ask if, in your knowledge, are there ladies you know who are interested in jazz as gentlemen are. I can count one, interested, not fanatic. and she isn’t my wife. At the Nice Jazz Festival last year there were a few ladies, but only ever in the company of their husbands or boyfriends, I think only being “sociable”. I only ever see men digging crates for vinyl. Whilst especially younger women are intent on occupying what used to be the preserve of men – supporting football teams, drinking pints of beer, wearing tattoos, “behaving badly” even, they do not seem to have caught on to jazz, vinyl, or hifi. Perhaps one day we will see supermodels cat-fighting over first pressing Blue Notes, but somehow I doubt it. Surveys show women’s interests as family, health, fashion and beauty. They let men worry about the important things in life, like politics, cars and old records. There is a line in the excellent Brett Milano book “Vinyl Junkies”, when the wife/girlfriend says something to the effect “That’s it! I’ve had enough! Either the records go or I do!”. He still has the records. This is a book that makes you feel almost normal, secure in the knowledge there are people out there with far more extreme an affliction than yourself. Recommended. 2,500 Bob Dylan records? If you were not crazy before, you certainly will be after. 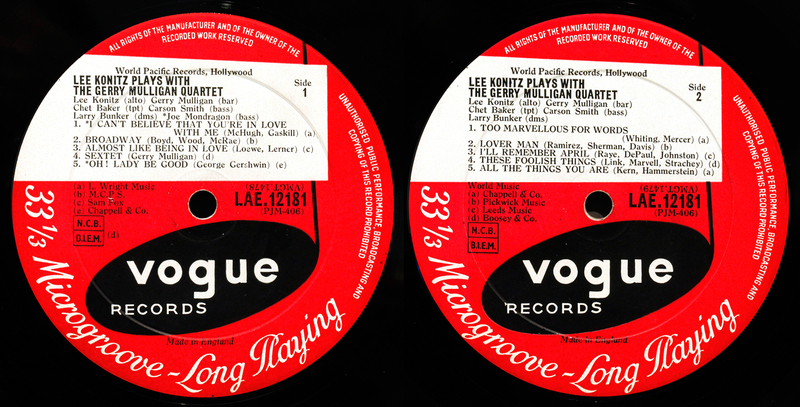 Reading about these 10,000 to 15,000 record collections, I begin to feel quite “normal” with my 600 jazz LPs. Imagine 30 IKEA Expedit 2m high cabinets. That’s not a record collection, that’s a furniture warehouse. Excellent! Konitz is killing on this. It’s interesting to me how exciting this can be with the rhythm section playing with such restraint. This may be the earliest Larry Bunker I’ve heard. I enjoyed his playing in Bill Evans trio w/Chuck Israels (who is a very underrated bassist IMO).